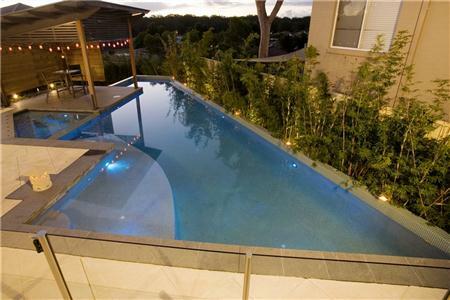 Polar Pools is a family owned and operated business based in the Hunter Valley with more than 20 years experience in the Australian pool industry. Separated by an eye-catching vertical water feature, this dual pool design brings a touch of Bali to a couple of coastal holiday homes. "One pool was constructed with a diving wall to create two separate swimming pools, similar to a duplex house," explains qualified landscape designer Cameron Leth. "We were able to build the pool out of the ground to reduce the height difference between house and pool. A negative edge weir was then introduced to connect the pool with the surrounding water views." 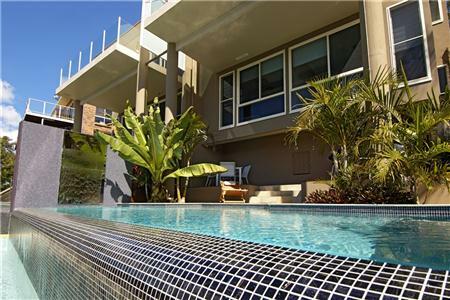 The concrete pool was finished with Quartzon then framed with Bisazza glass mosaic tiles on the waterline, weir and feature wall. A series of timber decks and boardwalks guide swimmers down to the beach below. 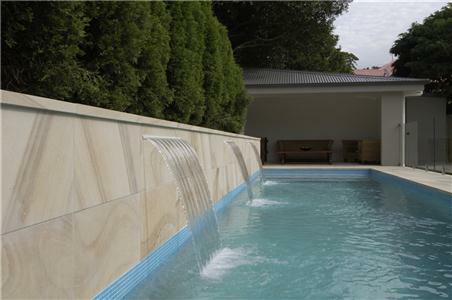 Located in Newcastle, NSW, this 12.5m x 3m lap-style swimming pool is surrounded by Gosford sandstone and finished with an 'Arctic White' pebble interior. Waterfalls fixed into the raised wall, frameless glass surrounds and quality building materials create an atmosphere of sophistication and decadence. "Our clients wanted a lap pool seamlessly integrated into a pool room/cabana that looked more like the kind of room you would find inside your the home rather than a simple shade structure," explains Cameron. "So we designed the pool for maximum effect when viewed from the house." The angular style of this geometric swimming pool was designed to mimic the architecture of the adjacent house, specifically the rooms featuring a 45-degree angle. "Integrating the two structures results in a functional, fully cohesive design," explains qualified landscape designer Cameron Leth. "We designed the pool so it was half in and half out of ground, and acted as a retaining wall that provided a level site straight out of the house." Surrounded by both granite and limestone pavers, the striking design includes a 15-metre length for laps and a child-friendly underwater ledge with swimout for the kids. Eight jets transform the spa into a welcome therapeutic tool while a sophisticated in-floor circulation system keeps water crystal clear throughout the year. "I have also included a ‘Claytons' weir to give the pool the appearance of a negative edge without the associated cost," Cameron adds.